Two weeks after not even being able to race in Houston, Monster Energy Kawasaki’s Eli Tomac now has a two-race win streak. 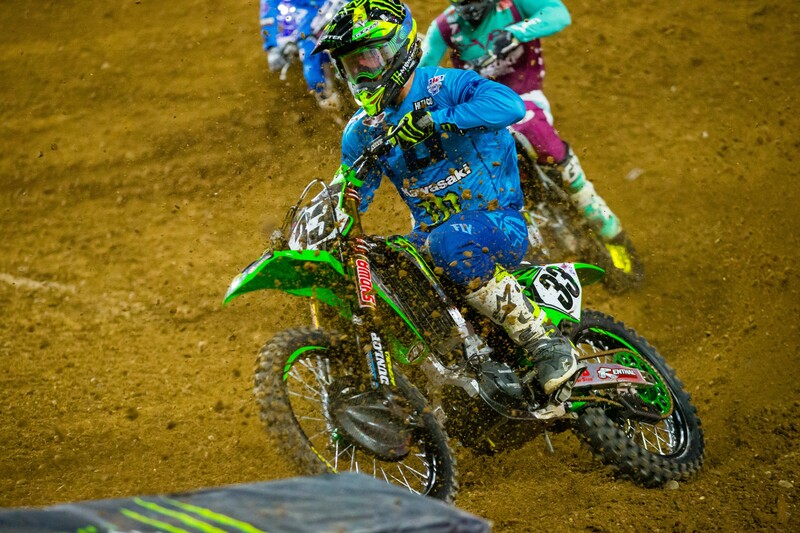 Could Tomac get on a roll like he did last year? Right now he’s 36 points down in the championship, which is not impossible to make up. That being said, it would be the largest comeback in the history of supercross if he were able to do so. History is not exactly on his side. 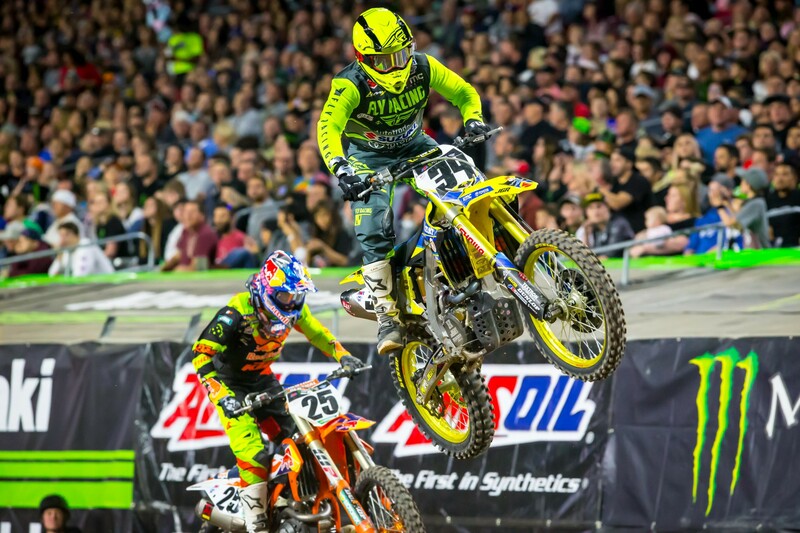 In Glendale, he got the holeshot and took off for his second win of the season. 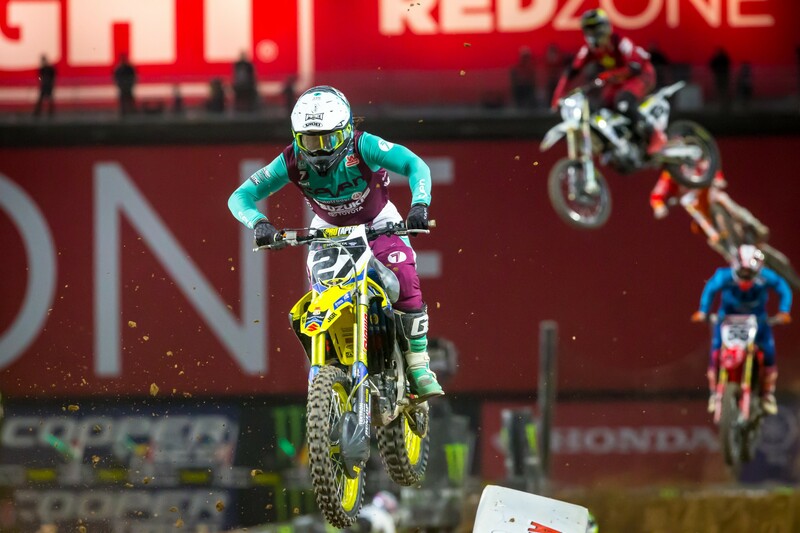 Monster Energy/Knich/Factory Yamaha’s Justin Barcia also got a good start this weekend and battled with his old teammate Weston Peick at the beginning of the main. At one point Tomac stretched his lead out to 6.5 seconds, but Barcia put on a charge in the latter part of the race and was putting serious pressure on Tomac. When the checkers waved, Barcia finished 2.1 seconds behind Tomac. The series points leader, Rockstar Energy Husqvarna’s Jason Anderson won his heat but had a bit of a quiet night in the main. He actually went backward at the beginning before finding his groove and making some passes toward the front for a fourth-place finish. “My practices were great today,” Anderson said. “I was able to figure everything out. I got pretty set up and was good for the night show. I qualified first in practice and was able to get another heat race win. I started out great in the main but got shuffled back to around seventh but then worked my way back to fourth. I just need to keep the ball rolling." Smartop/Bullfrog Spas/MotoConcepts Racing Justin Brayton came into the 2018 season in mid-season form from his Australian Supercross Championship and off-season races. He was able to pick up his first heat race win in Glendale and continues to show his speed. He now sits sixth in points just two points behind Cole Seely. Monster Energy/Knich/Factory Yamaha’s Cooper Webb has struggled throughout the early portion of the season. 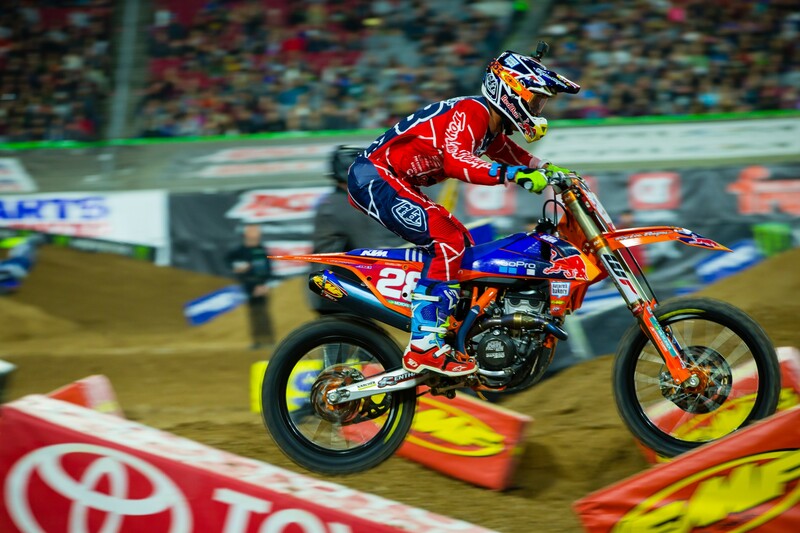 He didn’t start riding supercross until mid-November, then suffered an ankle injury in the middle of December that kept him off the bike for two more weeks. His results certainty aren’t for lack of trying, and he admits the 450 class is deep and tough. "We ended up finishing 13th, but at the end of the day you can’t keep your head down. We got a lot of races left to go. Going to go back and keep digging." Rockstar Energy’s Dean Wilson is also still nursing a shoulder injury from Anaheim 1 and is riding through a lot of soreness. He finished 15th, but is doing everything he can during the week to make it to the line each weekend to race. “This weekend was definitely better than last weekend,” Wilson said in a team statement. “I’m still trying to heal from my Anaheim 1 injury. It’s unfortunate to be riding where I’m at, but I’m out there trying to get some points. I definitely want to keep trying hard, improving, and healing." 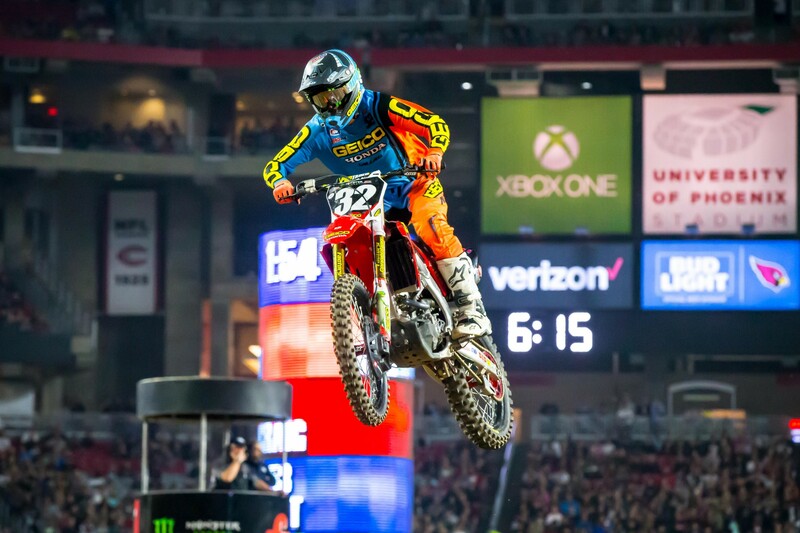 TLD/Red Bull KTM’s Shane McElrath came into Arizona tied in points with Joey Savatgy. He was out front briefly in the early part of the race before Plessinger got by and shut the door on him in the rhythm. He wasn’t too happy about it at the time, but got over it about a lap later and rode his own race. “I’ve been racing Aaron since I was on little bikes. I know that’s not something he’s known for,” said McElrath. “For a good lap, I was, like, boiling. But I had to calm down and really just focus ahead. I think Adam was right on me. I even seen his fender a few times in the corner. I just had to block that out. Monster Energy/Pro Circuit Kawasaki’s Adam Cianciarulo was able to take advantage of a late mistake by his teammate to finish on the podium. AC addressed the media on the post-race press conference on rumors that he was knocked out in a crash last week. “I did not lose consciousness at all,” he said. “One hundred percent did not. I will take it to the grave. I answered the concussion protocol or whatever. Right away I was fine. Clearly, I hit my face on the ground pretty hard. I don’t want to throw the whole deal under the bus. This doesn’t really help my case, but I couldn’t really remember it, honestly. It was just a bunch of questions. I love racing. I’ve done it my whole life. It means the world to me, but I’m not an idiot. I would not go out on the track if I thought—and I tweeted this and deleted the tweet because I was like, I’m not getting into drama, but here I am. I was not going to go out on the track if I didn’t feel safe. In the first 30 or 40 minutes after the crash, I was super banged up and just wasn’t in a good spot. I was like, ‘I don’t know if I’m going to race.’ Then I started to come around, and then I made the decision to race. I would never put these guys, anybody I race with, in harm or myself. It’s not worth it. That’s where I’m at. CycleTrader.com/Rock River Yamaha’s Bradley Taft put in an impressive sixth place finish in Glendale. After spending most of last season sidelined with a serious head injury, Taft has been working hard to put in a good result. This is his first top-ten of the season. 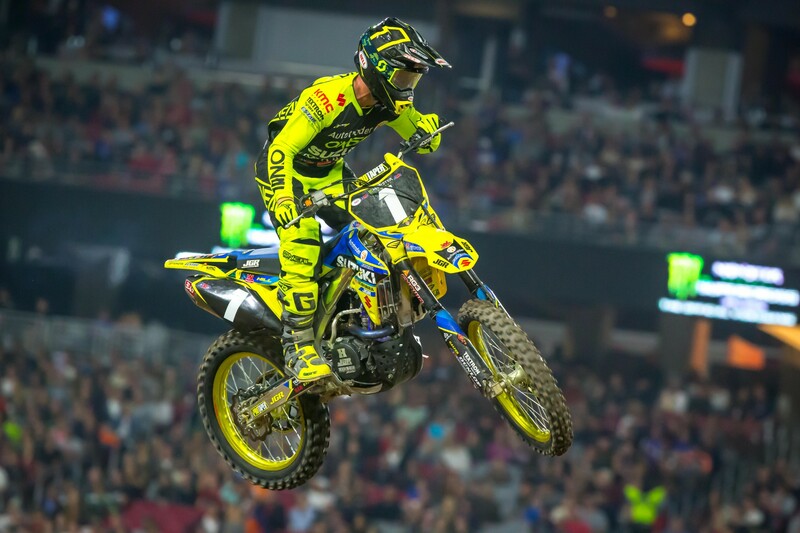 Defending West Region 250SX Champion Autotrader/Yoshimura Suzuki Justin Hill hasn’t had the season we all expected, with an average finish of 8.5 going 7-10-10-7 so far. We spoke with Hill after the race and he isn’t worried. “Much better than last weekend for sure,” he said. “We’re just making little baby steps towards a brighter future, and taking each little thing that can be changed and changing it for the better. It’s going well. I can’t really complain. Mitchell Harrison bounced back from a rough start to the season to finish eighth, his best result through four rounds. “I felt amazing on the bike all day,” he said in a team statement. “I had a great heat race, but I unfortunately fell. I was able to get up quickly finish sixth. I worked my way through the pack in the main and finished eighth. It was good progress for me, and I’m looking forward to more progression at the next race." 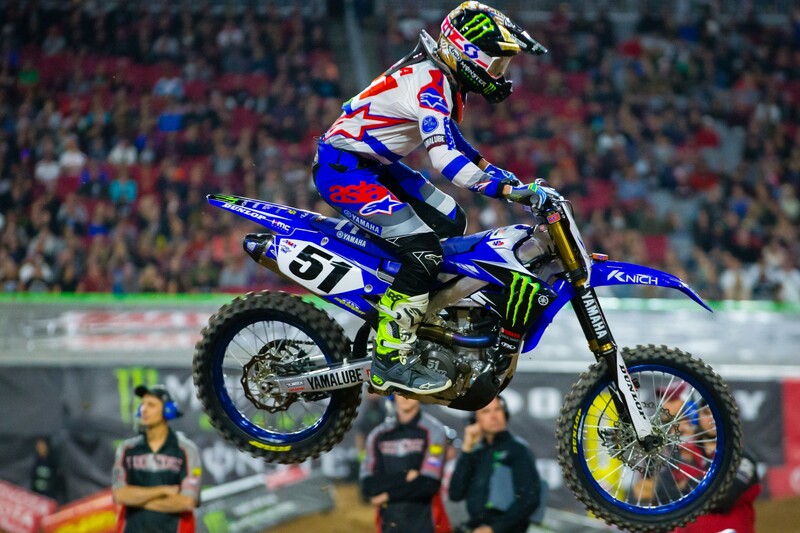 "I'm happy with another solid top ten," 51Fifty Energy Drink Yamaha’s Kyle Chisholm said following a ninth place finish. "I actually thought I was riding tight in the heat race, but it's good to finish up front like that and have times that were close to the leaders. In the main I was able to click off consistent laps and take advantage of other riders’ mistakes. The bike's great, my fitness is up to par, and I'm ready to keep the momentum moving forward."